Back in the high-life again? Inflation in Germany now exceeds the 2% mark. Inflation in the Euro Area at 1.9% is pretty much dead on target. The Euro-index has climbed to target quickly. In February it had sunk to a Year-on-Year reading of 1.1%; it moved up to 1.3% in March and in April. 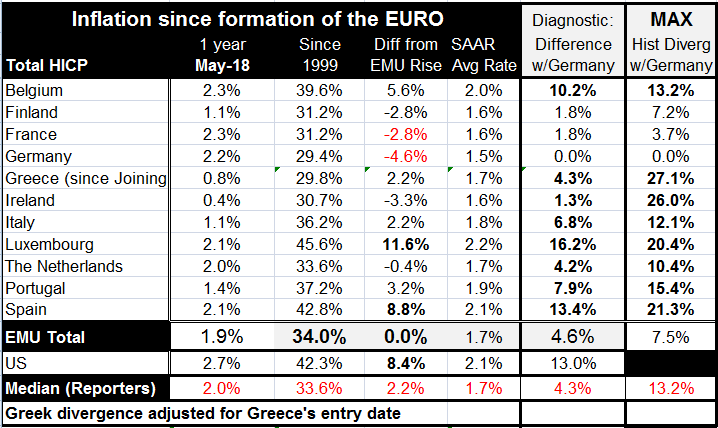 In May it jumped all the way to 1.9% from 1.3%- instant gratification (or fear and loathing, if you are German). Or is it? But inflation has not been pushed up to the 1.9% mark by the core. Rather it has been hijacked by oil prices. So the headline reading is really only technically on target. That's fine except the ECB does not do 'technical.' As Gertrude Stein might have said… a target, is a target, is a target. The HICP Core is up only by 1.4% year-on-year implying that the headline may not be long for being 'on target' with its rise of 1.9%. The core and or ex-energy readings of the largest EMU economies show that, in Germany, ex energy inflation is at 1.7%, in France it's at 1.3%, in Italy core inflation is 0.9%, in Spain it's at 1.2%. For all these cases except Spain core inflation progresses to higher 6-month readings then on to even higher 3-month readings. Every one of the BIG four economies (plus EMU itself) logs a three-month inflation rate in excess of two percent...again, except for Spain. So there is a mixed message of a mixed sort on EMU inflation. The headline is on a sweet spot. The core rate implies that headline gauge is distorted and inflation is not really that strong. Yet the core itself is riding rising momentum implying that the price strength may not be there yet but it might just be in the pipeline. With this as background the ECB today did what had been anticipated. It announced the end of its special stimulus asset purchase program. Many have commented that even with the weakened European data the ECB would go ahead and terminate the program partly because it was running out of usable collateral. The ECB will phase out its purchases and end them by December of this year. It will maintain monthly purchases of €30bln per month through September then step down the net purchase amount to €15 bln and terminate the program in December. Does chasing the Fed create a draft? Of course, the Fed is well on its way to higher rates and just yesterday lifted its benchmark Fed funds rate by 25bp marking its seventh rate hike. The Fed is well ahead of the ECB in the tightening cycle. However, the Fed is now also actively engaged in balance sheet shrinkage. It is reasonable to wonder about the global impact of having the ECB stop stimulus with Fed hiking rates and doing balance sheet shrinkage at the same time. While some developing economy currencies have been hit hard the Fed has said there is no forensic link from its policies to these events. But with the dollar as the principal reserve currency in our fluctuating rate system and with many important global commodities priced in dollars, anything that US policy does that affects the value of the dollar also affects the global economy. But just as President Donald Trump has taken to an 'America First' policy, the Fed seems to have become much less interested in the global ramifications of its policies. Fiddle Dee-dee, it's blinders on for me! It is often noted that one problem with instigating special programs for stimulus is that there at some point must be an exit. And exits are sometimes hard to orchestrate. We are in the middle of a good example of that. The European economy had been performing with real excellence until about six months ago; but it has since been slowing and now its policy metrics are much less ebullient and even dodgy; it no longer looks like such a propitious time to end ECB stimulus. But if not now when? And it's true that finding collateral to continue this program has been more trying so the program itself may be begging for a natural conclusion all on its own. Since we are in a low growth period it is easy for growth to slip into a 'worrisome' marginal zone. If growth maxes out at 2% then seeing weak GDP and other indicators becomes much more of a daily occurrence. It is in that spirit that ECB has set aside signs of weakening and is pushing ahead as growth seems to be in hand despite the obvious slowing. Waiting on the world to change-will fiscal policy make its presence felt? At the Fed the game is a bit different. There is a chunk of fiscal stimulus in the pipeline that the Fed expects to bump-up growth this year then it expects growth to slow and to slow again and to settle at the 2% pace by 2020. Today's US retail sales report may be the first real evidence that there will be a boost to consumer spending from US fiscal policy. But retail sales reports are fickle and even this one has some important flaws in it with too much strength in building materials and too little in Internet shopping. I looks a bit more like a weather report that set the consumer shopping at brick and mortar places instead of tapping at computer keys at home. US auto sales rose briskly in retail sales despite an earlier report of lower overall unit sales for new cars for the month – an odd result. So retail sales still have to prove their metal and, as for US fiscal policy, we have yet to see the impact on capital spending from the tax incentives for businesses that were adopted. The president has been talking 'home run' when characterizing his tax changes but we have hardly seen even as much as a base on balls. Are things about to change? On balance the world economy remains in the same precarious position is been in since before the Great Recession. There is supply a-plenty to the point of excess. There is still too little demand. But is there enough? Is there enough to support more normal monetary policy in the US and in Europe? The central banks are casting the dice but the data are still not very decisive on this issue. Europe is slowing, crimping its factory sector as industrial production reports have tanked and as services, based on some recent PMI indices, show substantial slowing as well. In the US the manufacturing sector – the goods sector in general- has been gaining pace with services looking softer. But wage and price trends are not confirming that there is any economic strengthening in the US or in Europe, even as labor markets 'appear' to tighten up. Making sense of the global labor markets remains one of the great challenges to the judgement of our central banks. Please grant them the grace to get this one right.